To understand the importance of that brand image, we should look first at what it provides. In the simplest form, a brand identity is all the visual elements of a brand, as perceived by the consumer. Visual elements include design, symbols and colours that work together to create a recognisable image. The importance of an identity is immense. An established brand or corporate identity becomes recognisable for consumers. Additionally, it provides customers with trust that will, in turn, become company loyalty. Corporate clothing can have an impact on your in-house workforce. This can spill into company branding objectives. It is a natural response that emerges through structure within all departments of your business. Providing corporate uniforms for employees will lift morale, pride and determination amongst the staff. Furthermore lifting and strengthening the company that they belong to. Implementing a company-wide corporate uniform policy will create authority, responsibility and professionalism. Employees that display a professional attitude will provide consumers with an understanding of the brand’s core values. This will lead to consumer trust and security within the company/consumer relationship. Staff dressed in company clothing will create an environment that operates on company values. This will lead to a desire among employees to further business agendas, including the brand objectives. When a workforce has pride within the firm that they work for, they have a higher tendency to spread branding material amongst others. In fact, it’s not uncommon for employees to attach company websites to their social marketing profiles. Often they will share company branding, digital images and video feeds as part of their personal identity. Team spirit is also a natural result of company uniforms design. It leads to the goal of increasing brand awareness and developing a corporate identity. By having a workforce with a high level of team spirit, your company will enjoy departmental interactions. Production will rise as team members brainstorm to do their individual and group tasks. From marketing departments to customer relations, team spirit leads to higher company attachment. Increased innovation and improved willingness to succeed within company goals will occur. Your brand image will have a faster pace of being obtained when all team members are on board. Company uniforms design are a simple strategy to install that begins within the company’s building. Consumers can make a near-instant connection to a company’s corporate identity through corporate clothing. As a company’s brand identity increases awareness, consumer relationships will become instantaneous. Customers will connect a brand identity to a particular company through visual branding design. By having a company uniform with the same design, consumers will recognise the employee clothes and branding. 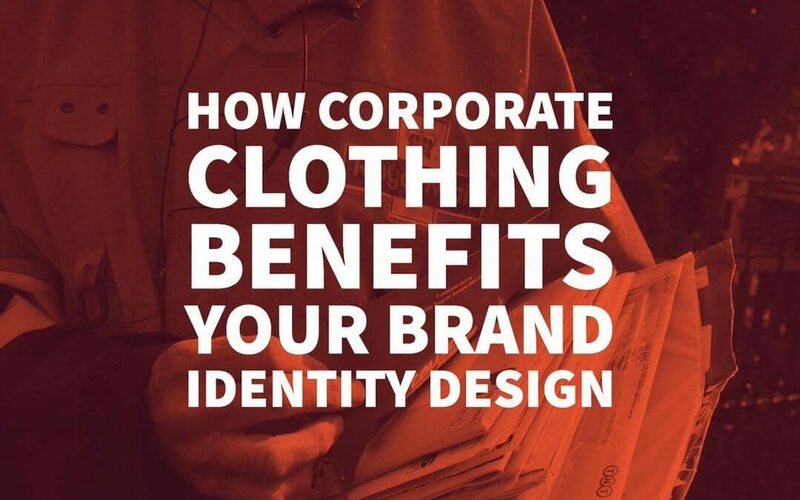 It’s a common practice amongst corporations to create business clothing designed around their brand marketing material – increasing brand identity. Through having a company-wide corporate uniform policy, consumers can see your branding elements at every point of interaction, especially within retail. By considering the top companies that have implemented clothing policies, you can see their brand identity via all employees. As a consumer and business owner, you have the same brand connections that average consumers do. The green shirt worn by Asda employees, the blue of Apple store ‘geniuses’ or red of the Royal Mail brings to mind the attached companies. This works with small establishments too, based on design or any other primary feature within company branding. To use corporate uniforms as a viable way to increase your corporate identity, you need to make the company uniform your own. This can work in several ways. Dependent on your individual company, it can be as simple as tying in your web colour scheme, or you may need to use your company’s centralised theme. Take a second look at Royal Mail. The colour of their shirt, including the Royal Mail logo, positioned on the upper left-hand side matches their website. This branding through work uniforms accomplishes two things. The uniform itself establishes authority and trust. The colour scheme and inclusion of the company logo provide consumers with familiarity at each point of contact. If a customer stumbles across the Royal Mail website for the first time, the colour scheme and branded logo used will provide them with comfort. A type of support provided through a familiarity of already knowing the company – through interaction with employees. On the opposite end, consumers who have only used the website will recognise and trust employees, by their uniform when they arrive at the door. Smaller companies with a local awareness will enjoy using company clothing to achieve brand identity too. Consider for a moment, a favourite local pub. They may not even have a website, and if they do, it may not be a primary consumer interaction point. Additionally, it may not be workable to dress pub workers in structured uniforms. Company branded clothing within a local bar environment can still improve brand identity. Rather than Polo shirts or button up shirts, employees can wear T-shirts that include the name of the bar and a slogan that consumers will attach with that pub. The shirts can even have colour alterations, provided the array of colours as a central theme within the bar. Company uniforms design, when used to build corporate identity, can be authoritative or fun. Based on the individual company and the theme within the company, the correct use of corporate uniforms can be established. The important point to remember is that once a theme has been created, it must remain as a centralised branding strategy. Do you work for a company that provides corporate clothing? How do you feel it impacts the brand identity? Having a corporate brand clothing is important like you point out because it is recognizable to the customers. When you see someone wearing one of your company shirts people should immediately be able to tell who and what they are. In my opinion, you do not want people running around in normal cloths doing work, because no one will be able to tell they are working, or who they are working for. Thanks for the great post. I agree that branding is something important to do to make sure that people know who you are and what you represent. For example, when we see an apple with a bite out of it, we immediately know the company that is talking. To get a company to that level a lot of branding is required. That is why I think companies should put their logos on everything they own. The more people see those logos, the more they will trust the company. When walking down the street, I can’t help but notice all the different clothes people are wearing. I’m impressed by the amount of companies that have shirts that represent them. I didn’t realize that companies benefit from this by using it as a form of advertising by having their logo and brand traveling wherever their employees walk. I’ll remember that next time I run into another company shirt. Uniforms help the consumer tell the players from the referees. They instill a sense of pride in the wearer. They provide the consumer a sense of confidence. They look good.